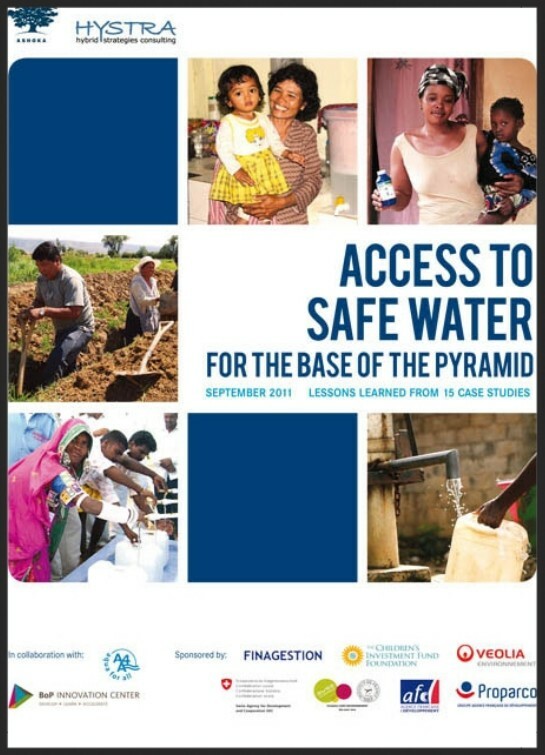 Link to a study of 2011 produced by Hystra on ''Access to Safe Water for the Base of the Pyramid'' and presenting 15 innovative projects and enterprises led by social entrepreneurs, NGOs and businesses that propose a wide variety of solutions, each differing in terms of services provided, treatment effectiveness, technology and sustainability to provide safe water to the poor in a sustainable and affordable manner. All of them provide solutions that cost less than the recommended 4% of the average income of a poor family in the BoP 500-1,000 range. The chosen projects also illustrate how the private sector can be called upon by public authorities to help develop and operate public infrastructure, or how it develops freely in areas with limited or no public service. The hand pump maintenance services through networks of spare parts resellers and local mechanics developed in Malawi by Inter Aide and BASEDA are described pages 148 to 155.